At 8 a.m. Tuesday morning, a construction crew descended on Hallockville Museum Farm in Northville like clockwork, installing new columns on the Hallock Homestead’s front facade. But instead of hard hats and overalls, the 13 men wore flannel button-down shirts and khakis. Some sported caps proudly declaring their service in World War II. Bob Jester still remembers the delight he felt as a young boy when he’d see his father, Walter, turn the corner while driving the Greenport Fire Department’s 1933 Mack truck. Some youngsters might have felt the same last week when the beautiful red truck passed by in Southold Town’s Memorial Day parade. More than 60 years after the pumper was retired from service — and two decades since the last effort to refurbish it — Mr. Jester and three fellow fire department volunteers have spent the past 2 1/2 years restoring the truck to its current, nearly complete, state. “Raccoons lived in it and holes had rusted through the seat,” Mr. Jester said, recalling the pumper’s condition when the project started in 2013. The driving force behind the restoration, the men will tell you, has been 86-year-old George Capon, a 67-year department member who can still recall when the truck saw regular action. Mr. Capon admits that when they started the project, he told the other members a little fib, hoping it might speed things along. “I said my doctor told me I only had five years to live,” he joked. They more than beat his deadline. While the most recent restoration effort officially began two years ago, it’s been a labor of love for Mr. Jester since 1965. That was the year Mr. Jester, then 18, approached the Greenport Village Board, $618 in his bank account, and asked to purchase the abandoned pumper. Then-mayor Arthur Levine told him the village hoped to instead display the truck at a park along Main Street. “I just about cried,” Mr. Jester said as he remembered the truck being towed from the firehouse to the park. Still, he never lost sight of the pumper. Fifteen years later, as a young man with a wife and five children, he once again approached the village. This time around, they sold him the truck for just $10. Mr. Jester said his restoration efforts moved slowly over the next decade. He eventually gifted it to another fire department member, Jamie Mills, who vowed to keep it in Greenport. Mr. Mills completed the truck’s restoration and, in 1990, the pumper was selected to represent 1933 in the FDNY’s 125th anniversary parade in New York City. After several years, though, the old truck was mostly forgotten again. Eventually, the barn where it was stored collapsed and it fell rapidly into disrepair. Mr. Jester, who can recite the truck’s history off the top of his head, didn’t want that to be the end of its story. The first fire the truck ever responded to was at St. Agnes R.C. Church on Front Street. By 1950, it had responded to more than 350 calls. Mr. Capon recalled finding the truck completely covered in ice after responding to a winter fire at Brigham’s Shipyard that occurred soon after he joined the department. Mr. Grilli said the fire department still has old photos of the pumper and even a 16mm film of it in action. When the latest restoration effort began, the team convinced fellow Greenport Fire Department volunteers to take ownership of the truck and store it in the garage at the Third Street Firehouse. Another option would have been to let the Village of Greenport take possession of it. About two dozen department members volunteered to help with the rebuild in 2013, but that number slowly dwindled to four: Mr. Capon, Mr. Jester, Mr. Grilli and Charlie Hydell, who did the woodwork. To ensure the restoration’s success, they worked deep into the night and on weekends after this year’s cold winter passed — and once Mr. Capon returned from Florida to crack the whip. The final piece of the puzzle for getting the truck back on the road was rebuilding the transmission and freeing the clutch. About a week before it made its public debut at the Memorial Day parade, where Mr. Grilli could be spotted driving it down Main Road in Southold with Mr. Capon on board, they took it for its first test drive around Front Street. “Everyone was giving us the thumbs up,” Mr. Capon said. Virtually all the truck’s parts, and certainly its look, are authentic to 1933. Mr. Jester and Mr. Capon said the cost of the restoration has been about $25,000, and they estimate similar projects have been outsourced in other departments for upward of $250,000. The project has been a big hit with community members who have seen the truck restored to its former glory. Ken Korsh of East Marion said he first learned about it through Mr. Capon and was impressed by what he saw. “It’s really a nice-looking truck and a terrific story,” he said. The group’s work isn’t quite finished, however. The fire department is attempting to raise $3,000 through a bike raffle to pay for the new tires they’ve ordered. And this summer, the men hope to get the truck’s water pump and fuel gauge working again. They also plan to work with a local funeral home to retrofit the bed of the truck to carry caskets for fire department funerals. They say the emotions they have about the truck now are nothing compared to what they’ll feel when that happens. “That will definitely be rough,” said Mr. Grilli, the truck’s driver. Of course, they hope that drive to the cemetery won’t occur for some time. Right now, they’re just happy to have saved the 82-year-old truck from heading to another funeral — its own. 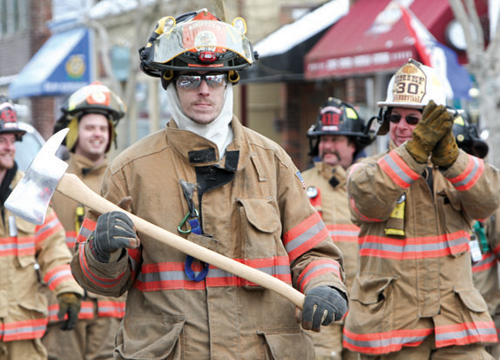 Local fire department and ambulance chiefs are praising recently signed legislation that protects volunteer firefighters and EMTs from losing their regular jobs for missing work while responding to disasters and crises. COURTESY PHOTO | ELIH Auxilians Nora Busch, Alice Roggie, 1st Vice President with Paul J. Connor III, President/CEO, Eastern Long Island Hospital; Thomas E. Murray, Jr.; Toni DeMeo, Volunteer Services Coordinator and Helene Fall, 2nd Vice President. Eastern Long Island Hospital’s Auxiliary set a personal record last year, contributing a total of nearly $375,000 to the hospital. The auxiliary — which in November was named ‘Auxiliary of the Year’ by the Health Care Association of New York State — consists of nearly 300 volunteers, who contribute a total of approximately 25,000 volunteer hours annually. In addition to transporting patients, aiding visitors and assisting clerical staff, auxiliary members perform advocacy work in the form of letter writing campaigns to local, state and federal officials. The group contributed $372,000 in total last year. The hospital said that with the winter months in full swing, more volunteers are needed at this time however, since many volunteers head south for the winter months. Those interested in volunteering can call call Toni DeMeo, volunteer services coordinator, at 631-477-5196. NEW BEGINNINGS COURTESY PHOTO | Volunteers helping frame the first floor of New Beginning Brendan House on Sound Avenue. Work has officially begun on the long anticipated New Beginnings Brendan House, but to get the home finished the non-profit foundation is in need of volunteers. She and husband Steve are looking for volunteers to help with the project, which will serve as a home for people who have suffered traumatic brain injuries and need round-the-clock care. They are looking for framers, electricians and plumbers, as well as cleanup crews and people to donate or help prepare lunches. Volunteers will be needed every Saturday and Sunday, Ms. Scerri said. Those that need to perform community service can also take part, and letters outlining their service will be given, she said. They have hired Roy Schweers of Schweers Construction to work as the project manager. He helped build the non-profits Medford site, she said. “We call him the builder of dreams, and he’ll donate a day here and there too,” she said. This Sunday three volunteers helped frame the first story of the home, Ms. Scerri said. “We want to get the word out. There are so many good people that want to get this done for the community,” she said. At the same time, the non-profit is still trying to raise the funds needed to complete the home, so the more volunteers the better, she said. Those interested in volunteering should reach Steve Scerri (516) 356-5642. Michael Hubbard, a Riverhead teenager who suffered severe brain damage in the aftermath of being badly burned by an exploding gel candle in his backyard in May, 2011, is expected to be one of the residents of Brendan House.